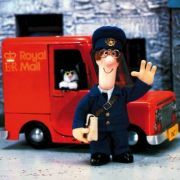 Good old Postman Pat. Â He must be the envy of all other postmen as he drives around the sleepy little village of Greendale in his shiny red van, delivering the post to a handful of happy occupants. Â Contrast that to a regular postmans life, delivering hundreds of letters and parcels in the rain on a bicycle, and taking most of the parcels back to the depot because there was nobody in to sign for it. Yes, Pat Clifton (bet you didn’t know his surname!) really is a happy man, as the theme tune to the series states, and let’s face it he deserves it. Â I don’t think I’ve ever seen him get angry or impatient, so good for him. The first series of Postman Pat aired on BBC1 in 1981, and was a stop motion animated series about a friendly postman and his black and white cat, Jess, who rides around in Pat’s bright red van doing what cats do best. Â That is, not a great deal. Â Jess generally just stuck her head out of the window and miaowed a bit. Some facts about Pat’s post office van. Â It’s registration was PAT 1, so he must have paid through his (quite long) nose for that particular number plate. Â The van initially had a yellow crown on the side, but before long the UK Post Office gave permission for the proper Royal Mail logo to be used. Â It may only be a small thing, but it did make Pat’s job as a postman seem somewhat more credible (in so far as a puppet series can be). Â This led to Postman Pat being used by the Post Office as a sort of mascot for a time. The village of Greendale looks like a lovely place to go and retire, full of beautiful rolling hills, dry stone walls and little flowing streams. Â The inhabitants are also a friendly and helpful bunch, from Mrs. Goggins who runs the post office in the village, to the village vicar Reverend Timms and handiman Ted Glen, who appears to be able to fix just about anything, from fences to broken cars. Â The only slightly disagreeable member of Greendale was Miss Hubbard, the busy body old lady who was always wobbling around on her bicycle and sticking her nose in where it wasn’t needed. In 2004, over 20 years since he first appeared, a new series of Postman Pat was produced. Â Here Pat’s responsibility has grown somewhat (somebody must have realised he was living an easy life) and he is now head of the Special Delivery Service for the town of Pencaster, of which Greendale is a local offshoot it would appear. This entry is filed under TV - Kids	and was posted on October 9th, 2008. You can follow any responses to this entry through the RSS 2.0 feed. You can leave a response, or trackback from your own site.